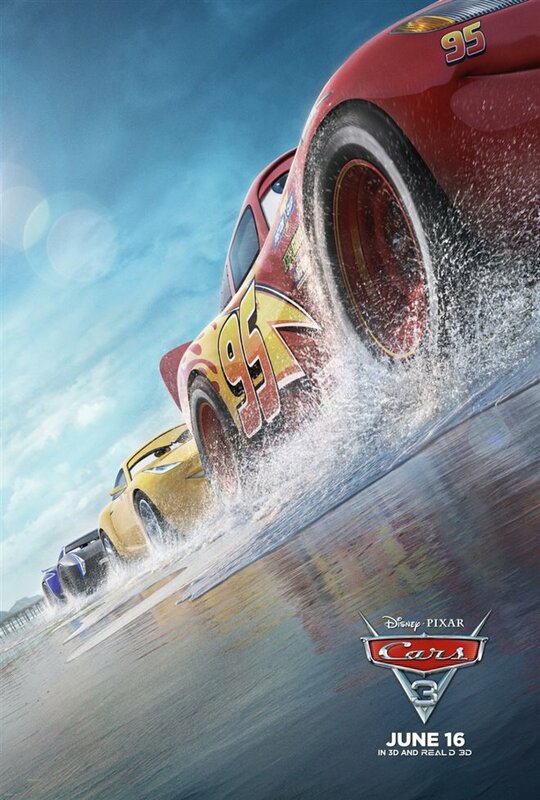 Joel’s review of Cars 3 (2017) | Tales From The Ipe! and cameo roles from Kerry Washington, Bob Costas, and a few others. If you’ve seen the trailers, the film’s plot is about your hero, Lightning McQueen, meeting his new faster and younger rival Jackson Storm. Actually, there are a bunch of these newer faster guys, and all of Lightning’s old racing rivals can no longer compete against the new guys so they retire and get replaced by these new “Bros”. Soon, Lightning himself is struggling, and ends up in a bad crash. He’s off to recover and find himself, do some training, and decide what to do next. He’s got Cruz Ramirez (Alonzo) and the old crew trying to help him find his way. The story is basic, but it’s entertaining. The visuals are pretty nice, especially the views from the racetrack. I also liked that the film’s finale took a different direction than you might have expected. I started to get a hint towards the end, but I’m glad the Pixar team took it there. It’s a pretty decent and entertaining film, and won’t hurt your head like Cars 2. Wow, I didn’t like that 2nd film. This entry was posted in Entertainment and tagged animated, cars, disney, movies, pixar. Bookmark the permalink.